The pension crisis in America is speeding up. We’ve seen several public pensions fail in the past year, and a landmark court decision has allowed public pensions to slash benefits for the first time in history. Now, private pensions are buckling as well. 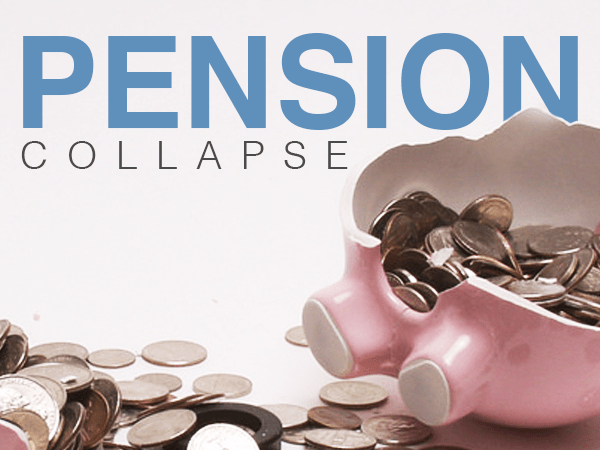 This isn’t just bad news for pension holders. Anyone’s retirement savings could be affected by these latest developments, young or old. After floundering for years, public pensions started collapsing in a big way after our last major crisis. Since 2008, five major U.S. cities have filed for bankruptcy for their troubled public pension programs. Then in January of this year, the U.S. Treasury granted permission for a public pension to renege on its beneficiary obligations for the first time — based on a new legal precedent set back in 2014. State and local pensions across the U.S. have $1.8 trillion less than needed to cover all the benefits owed in the decades ahead, according to Federal Reserve Board data. The need to make up for such shortfalls has contributed to credit-rating cuts to Illinois, New Jersey and Chicago. Such financial pressure has also been acute in California, where it helped bankrupt the cities of Stockton, San Bernardino and Vallejo. Public pensions are being forced to deal with reality. For a whole host of reasons — some the fault of fund managers, others caused by the market — pensions simply can’t pay out their benefits as promised. The strain of increased beneficiary lifespan, a growing number of beneficiaries overall, and the challenge of investing funds safely and effectively is putting pensions in an impossible position. Major pension cuts by two Fortune 500 companies give us proof. First, UPS just announced big cuts to its pension program for the next five years. The company will freeze pensions for more than 70,000 of its non-union employees, due to a $70 billion shortfall. And second, shortly after UPS’s announcement, similar news came out from General Mills. Executives plan to totally freeze the company’s pension plan by 2027. These two cases confirm a broader trend toward private pension benefit downsizing, outlined in a 2016 research report by Willis Towers Watson. The report shows a big contraction in private pension benefits over the past decade, and it predicts the trend will only grow stronger in the coming years. This trend is causing big problems for older workers in the private sector, and it’ll only get worse. Plus, it’s intensifying the risks already present from the public pension crisis — a set of risks, which as we’ve discussed before, could easily “snowball” into a larger economic crisis that hurts us all. The instability in private pensions shows that the pension crisis isn’t going to slow down anytime soon. And its impact on Americans is only going to grow more severe. Whether you’re invested in a pension or not, this is an important time to start protecting your savings.